The grape has been grown and fermented into wine in the foothills of Amador County since the first days of the Gold Rush. While many dreamed of overnight riches in the gold fields, others saw wealth in the region's red soils and Mediterranean climate, patiently planting gardens and orchards, wheat, and vine. These vines, some of the oldest zinfandel in California, have produced distinctive wines in a viticultural tradition that has survived the ravages of mining, disease, and Prohibition. After Prohibition, the region slipped into quiet jug production until its rediscovery in the 1960s. While the Shenandoah Valley is undeniably the heart of Amador's winemaking region today, vineyards flourished historically from Sutter Creek to Fiddletown, from Jackson to Ione, and tasting rooms are open countywide. Kimberly Wooten and R. Scott Baxter, historical archaeologists and longtime Amador County residents, present the landscape of the region's diverse and historic wine industry. Over 200 photographs, selected from collections of local winemakers and wine grape growers, offer a visual story of the vine and its relationship with the people and development of the region. 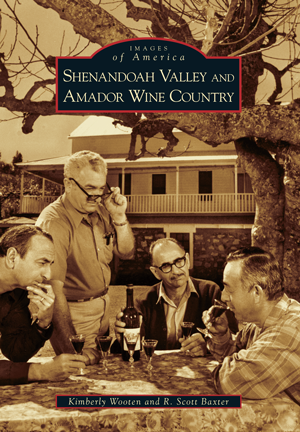 Today's vintners have opened their cellar doors, welcoming the reader inside and revealing the deep-rooted saga of winemaking in Amador County and the Shenandoah Valley.